This is the perfect escape for your next vacation up north. 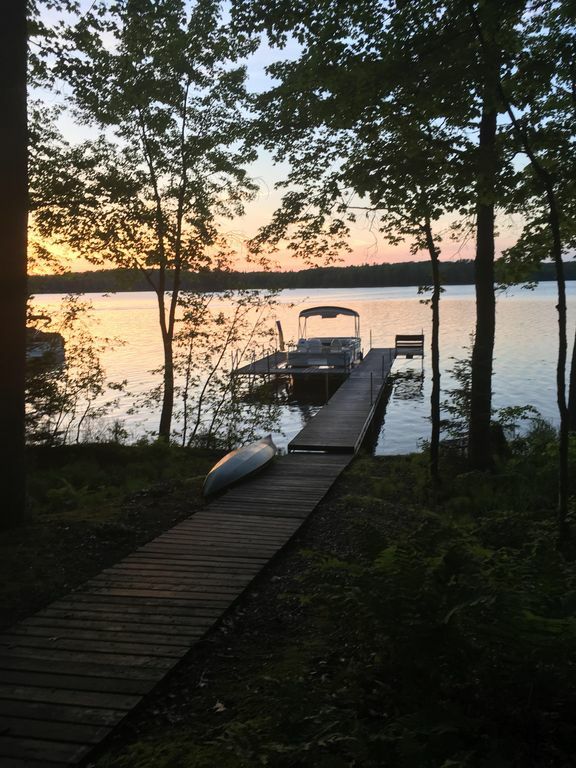 Whether you plan to ice fish, ATV, snowmobile, snowshoe, cross country ski, boat, fish, hunt, waterski or swim- every season is the right season to enjoy this year round cottage. There is a huge brick fireplace in the living room. A nice three season porch off the main deck with a waterfront view. There is a flat screen TV with cable and wifi service. Loft has a king bed with a futon. There are two bedrooms on the main floor- one with a king and the other with bunk beds (double on bottom/twin on top). Living room has a couch and there is a futon in the screen porch so there is plenty of room to bring along your friends. The cottage is tastefully decorated in northwoods decor and has everything you need to make yourself at home. Family friendly with a fire pit, games, movies and swings. There is a pontoon available to rent. We bought the cottage in 2005 and completely renovated it. We have made many wonderful memories there. We look forward to sharing it with you and your family. Located 30 minutes from both Antigo and Rhinelander. Excellent recreational activities available on and near the lake. There is one very small bathroom. It has a toilet, shower, and sink. Please keep this in mind. While our max occupancy is 8- we assume some of them will be children. With only 1 bathroom, our cottage is not suitable for 8 adults. Local calls only. Bring a calling card or cell phone. No heat in upstairs loft. Space heater is provided. Two adult (one male/one female) bikes are available. Bring your bike helmets. No negative issues. The hosts are very welcoming. The cottage was perfect! Very clean and well equipped. Will definitely book again. Somehow Loon Lodge was even better than we had hoped. When we walked in I instantly knew we were going to love it. The place had a cozy, comfortable style with everything we could wish for during our week stay. It’s located on a clean, beautiful lake that was surprisingly quiet for August. We loved watching the hummingbirds at the feeder, the loons on the lake, and the eagles swirling in the sky. Lovely setting for our winter getaway! This vacation home is very clean and well-stocked. We enjoyed cable tv options, beautiful views, and the fireplace. Owners were very responsive and made sure that the deep snow was cleared from deck and all walking/parking areas. Would love to return in summer to enjoy the lake and screen porch attached to the deck! Cozy, Comfy, Clean Cottage getaway! The cabin is very well kept with all the essentials including towels, essential spices, fire wood, and many other essentials we have found other rentals don't provide. It seemed anything we needed or forgot, they had at the cabin. The coziness of the cabin was just what we like, especially for a winter stay. Wine and the the crackling fireplace were perfect evening relaxation. Our 3 girls even sled down the driveway for hours. We also ice fished and snowmobiled. The boat landing is just down the road for easy access to the lake by snowmobile or truck. There is also a snowmobile/ATV trail just down the road that was easily accessed from the cabin. The trails from this access point are endless! Elcho is close for any needs. I can't say enough how much we enjoyed this property. Super Cozy! The owners do a great job in providing an overall positive experience. I'm almost certain we will be back! Thanks for sharing! Ice fishing, campfire, fireplace, flatscreen TV, cable, wifi.